If you're a regular reader of this blog, you'll probably be aware that I like a full coverage foundation. Estee Lauder Double Wear has been my Holy Grail for a while now, and I'm always looking out for good drugstore alternatives. (So far, Revlon ColorStay comes out on top for me. You can read my review of it here.) 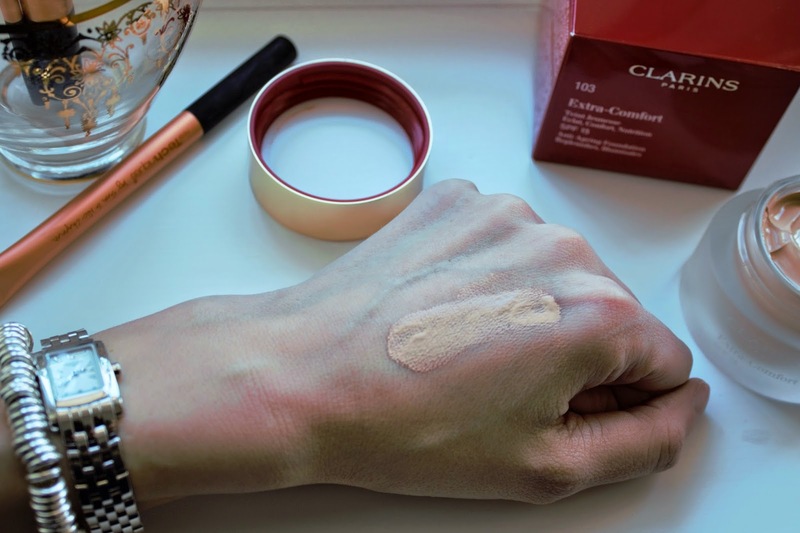 However, there's another high end base that's been on my wishlist for a while - Clarins Extra Comfort. I felt like treating myself after moving house, so I picked it up a couple of weeks ago. It comes in a glass jar with a gold lid. Possibly not the most practical packaging, but isn't it pretty? I've seen a couple of bloggers talk about this foundation, most notably Laura from Buy Now Blog Later (one of my all-time favourite blogs). If I hadn't, I might not have considered Clarins when looking for a foundation, as I tend to think of them primarily as a skincare brand. The power of the blogosphere, eh?! The foundation feels beautiful to apply. It looks quite thick in the jar but doesn't feel that way at all. 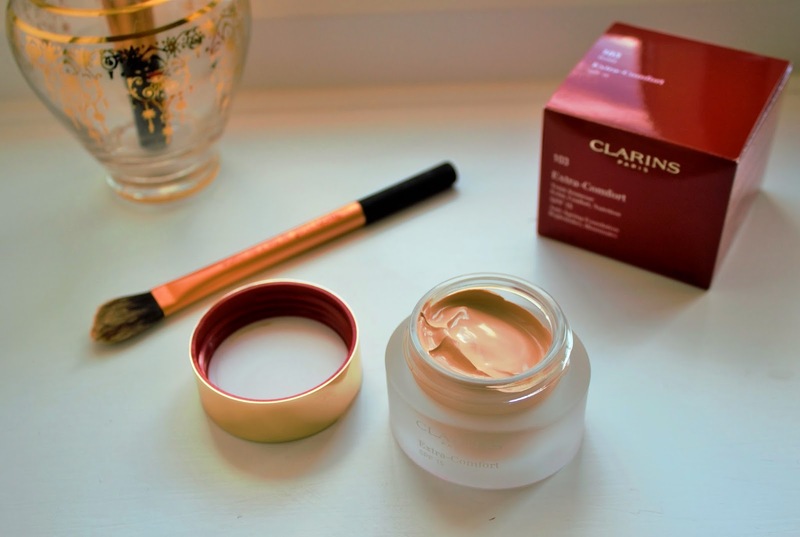 It feels like applying moisturiser, and has that pleasant, plant-based smell that I associate with Clarins skincare. It's targeted towards dehydrated skin, which makes it good for me at this time of year, when cold weather and central heating tend to dry my skin out. While I do love Double Wear, it can sometimes look a little patchy towards the end of the day when my skin is dry. I haven't had that issue with Extra Comfort, although I have to say that the longevity isn't quite as good as Double Wear. The other main difference between the two is the finish. Extra Comfort is dewy and natural looking, whereas Double Wear is matte and quite flat. I never used to like dewy bases on me, but I've actually been loving it for a change. While I don't think anything will ever match the coverage of Double Wear for me, this one definitely doesn't disappoint on that score. Coverage is my number one priority when it comes to foundations, so this puts Extra Comfort firmly in my good books! Here it is on my face. I don't really know how useful face shots are when talking about foundations, but I've included this one because I think you can kinda sorta see the dewiness as the light hits me from the side. I'm not wearing a highlight and I've powdered over the base. My shade is 103 Ivory, which is the lightest they do. So, to conclude, I really like this and can see myself wearing it a lot! 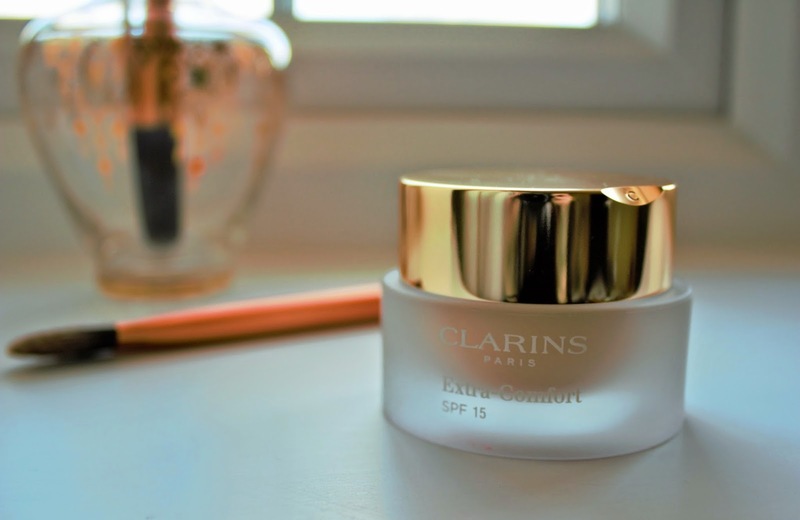 Have you tried Clarins Extra Comfort? What's your favourite high end foundation? You look so stunning! I think it definitely looks like a great foundation. And I actually love the packaging, super cute. I love how amazing you look! The foundation seems great, awesome review! That looks amazing! Seems like a great product. Baeutiufl result on your shiny face. Hello Kate! It's always fun to try different brands and formulas! I am glad this new one did not disappoint you. I thought there was a highlighter, that was a surprise! And thanks for sharing your beautiful face! hihi. I am about to finish up the bottle of my MAC Pro Longwear foundation. I also love full coverage bases! I am eyeing to get the one from Guerlain! Let's see! Hi Kate, I love reading your blog so much so I've nominated you to for the 'Versatile Blogger Award'. It's a great way to increase your followers and grow your blog's presence online. 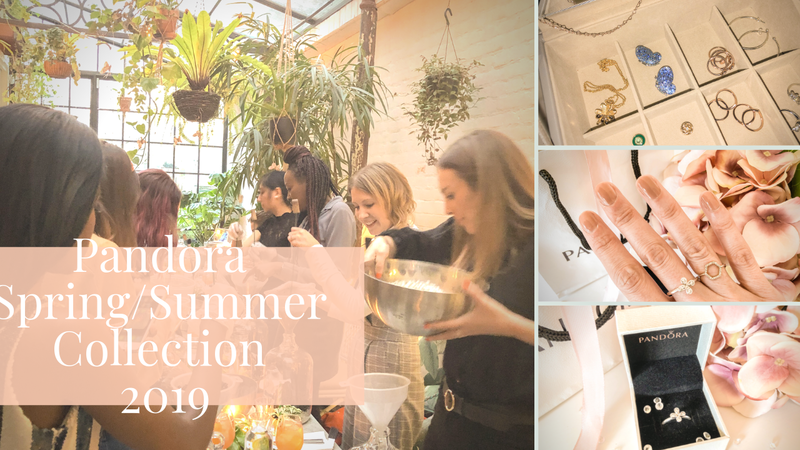 Check out my most recent post to find out what you have to do! The foundation looks really good on the skin! Great post! Thanks for sharing this to us. You look stunning btw. I definitely see the dewiness. It's as though you have a glow upon you. I've never tried Clarins foundation, or anything other than skin care.